When it comes to cooking, I much prefer preparing savoury starters and fancy main meals. I enjoy eating pudding but there's so much more involved in preparing a tasty dessert. This easy, sweet dessert is great to serve up alongside the coffees. If it wasn't for the copious amounts of full fat mascarpone, this dessert might actually be good for you. Spoon the mascarpone into two bowls. 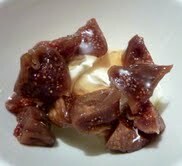 Scatter the quartered figs over the soft cheese. Drizzle the runny honey over the top. In Greek mythology, the god Apollo sends a crow to collect water from a stream for him. The crow sees a fig tree and waits for the figs to ripen, tempted by the fruit. The crow knows that he is late and that his tardiness will be punished, so he gets a snake from the stream and collects the water. He presents Apollo with the water and uses the snake as an excuse. Apollo sees through the crow's lie and throws the crow, goblet, and snake into the sky where they form the constellations Hydra, Crater, and Corvus.